With the advance in technology to support an on-demand economy, B2B wholesale customers are expecting the level of service they get as individual B2C consumers. You’d risk losing customers and revenue if your wholesale business lags behind in efficiency, sales enablement, and customer experiences. You can also provide special savings for retailers that purchase in bulk to encourage large volume orders. Offering special deals can help cultivate loyalty with your current clientele. The more purchases customers make, the more likely they will return to your business. To encourage employees in retail outlets to recommend your products, you can create a sales incentive program to reward those employees. Not only does this support sell through but also gets you closer to the next big purchase order you’ve been waiting for. 90% of sales happen at physical retail, do you want to jeopardize losing that volume with aggressive direct to consumer tactics? Wherever physical retail carries your product, online sales have the potential to double. If more units are sold and on display in a market, it just makes sense more traffic heads back to your website. Reward your best dealers with a click and collect program to support sell in and sell through to grow your business together. To increase the ease of purchasing — which is critical to conversion and customer retention — implement a robust B2B eCommerce platform and automate the fulfillment process as much as possible. Whenever appropriate, make sure all interactions with your sales and customer service representative are reflected in the customer profile and the personalized pricing on your site. Make it easier for dealers to order from you with permission based access to inventory, account pricing, wholesale shipping rates, and volume discounts to place orders 24/7. A retailer can lose revenue if a product is out of stock. By offering fast shipping to your customers without additional cost, they’re more likely to order from you time and again. Having a B2B platform that seamlessly integrates with your ERP or eCommerce capabilities to ship quickly is critical. You also want to make sure product demands are forecasted accurately so you can plan production and avoid delays in delivery — which can hurt the trust and relationships you’ve built with your customers, causing them less likely to order from you again. Whether online or offline, make sure your customers are getting the assistance when and where they need it. Train your sales and customer service representatives to interact with your customers in a friendly and professional manner, while empowering them to make decisions that put the customers first. Including giving options to pay on account or more commonly being used on credit card. If your products are technical in nature, you can provide in-store training for your key accounts so their employees can effectively sell your products. 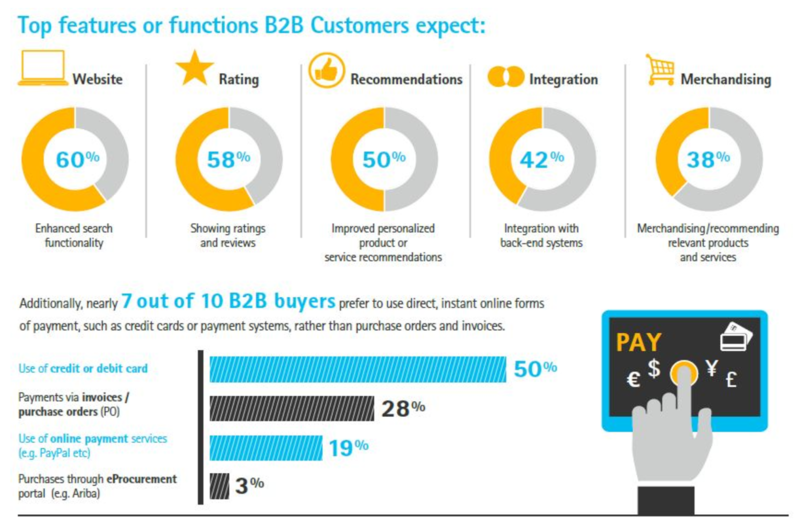 Omnichannel sales and customer support are now expected of B2B merchants and wholesalers. Your sales reps, eCommerce platform, and other customer touch points need to provide a seamless experience. Become a valuable partner to your customers by offering insights on their competitors and make suggestions on popular products that are selling well with other retailers and in their trade area online. This will not only help you increase sales for your wholesales business by getting customers to order a larger variety of products from you but it also builds relationship and loyalty as they perceive you as a trusted advisor to influence their store assortment. Encourage retailers to try out new merchandise by offering a bundle discount with a product they’re currently purchasing, and provide support such as in-store point of purchase materials or displays to help them cross-sell or ups-sell this new item to their customers.